Police and legal leaders from major cities across the U.S. have signed a pledge to help reduce mass incarceration. Guess who's not on the list? Increasing alternatives to arrest and prosecution, especially mental health and drug treatment. Policies within police departments and prosecutor’s offices should divert people with mental-health and drug-addiction issues away from arrest, prosecution, and imprisonment and instead into proper treatment. Reducing unnecessary severity of criminal laws by reclassifying some felonies to misdemeanors or removing criminal sanctions where appropriate. Reducing or eliminating mandatory-minimum laws that require overly harsh, arbitrary sentences for crimes. Strengthening ties between law enforcement and communities by promoting strategies that keep the public safe, improve community relations, and increase community engagement. Whether this new effort will lead to demonstrable change in communities already wrecked by over-incarceration—or whether it helps drops incarceration rates in general—of course, remains to be seen. The group’s statement still reflects the belief that “some people need to go to prison, particularly those who have committed serious and violent crimes,” as it reads in the “The Way Forward” section of its principles statement. Violence remains the top qualifier for jail time, with far more people in federal and state prisons for crimes considered violent, however defined, than anything else. Andre Anderson, interim police chief for Ferguson, Missouri: Given all that has transpired here since a Ferguson police officer shot and killed Michael Brown, you’d think somebody from Ferguson would be among this enclave. But there’s not even anyone from St. Louis in the group. The only law enforcement official with any connection to Missouri is Edward Dowd Jr., a former U.S. Attorney for the Eastern District of the state. Rudy Giuliani: This former New York City police chief is sticking to his guns on the very practices that have driven up mass incarceration, namely “broken windows” theory and stop-and-frisk. 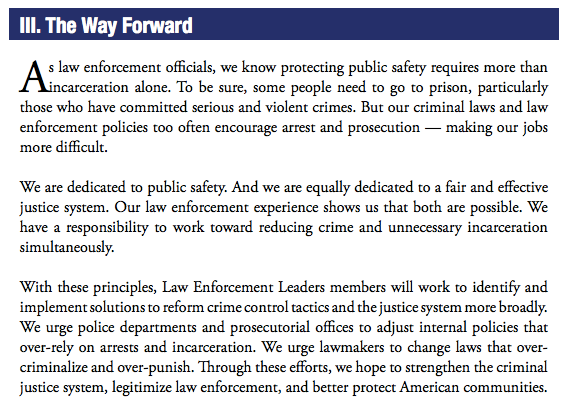 The new Law Enforcement Leaders group doesn’t exactly rebuke such tactics by name in its report. And while New York’s current chief, William Bratton, is a member of the new group, he was defending those practices as recently as last winter. Bratton has since calmed down a bit on police reform. Giuliani might want to follow suit, given the hundreds other former and present police chiefs headed in a different direction. Sheriff Joe Arpaio: This Maricopa County sheriff makes headlines almost weekly for his policing shenanigans. He is such a loud champion of racial profiling that the practice could arguably be dubbed The Arpaio Method. Yet it’s that exact method that has landed him in court, where he’s fighting contempt charges. This would be a good time to soften his views, break with his past and join his fellow sheriffs in the march away from profiling. Practically anyone representing Florida: There is one active police chief, Miami’s Rodolfo Llanes, among the Law Enforcement Leaders, and one retired sheriff from Monroe County. There is also a former U.S. Attorney for Florida on the list. But Florida warrants some special attention: Not only is it one of the most populous U.S. states, but it is also the state with the highest rate of felony disenfranchisement. Almost six million people in Florida were unable to vote in last November’s elections because of past and present prison status. If any state needs its local law enforcement leaders rethinking how it handles crime, it is Florida. Practically anyone representing Louisiana: While this new coalition is headed by Ronald Serpas, the former police superintendent for New Orleans, no other police chief or sheriff from the state that leads the world in incarcerating people is among its membership. Louisiana is also home to the death-sentence capital of the nation, Shreveport, thanks in large part to Caddo Parrish District Attorney Dale Cox, a prosecutor (certainly not on the list) who takes no small delight in sending people, particularly black people, to death row. The Law Enforcement Leaders group has a rolling, open enrollment, so any of these figures could become members at any time. The only membership requirements are that a person have led a law enforcement agency or association, and that they sign on to the mission statement. But doing so essentially means signing a confession that traditional policing practices have devastated families and communities for decades—a confession that would have much more consequential value if it came with restitution to the people they helped destroy.